Can you imagine watching the archaeological site of Teotihuacan over 300 meters high? 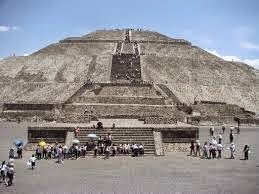 Come to San Francisco Mazapa, next to the pyramids, and a hot air balloon rides in the beautiful Teotihuacan Valley. Start your tour starting at seven o'clock and get ready admire the City of the Gods suspended in the bucket. appointment is in San Martin of the Pyramids, 12 kilometers from the archaeological site. While it is not necessary that you have a bike itself, because you give them, it is essential to know bicycling and are ready for a trip of at least three hours. These tours cover the area of the pyramids and in some cases many nearby tourist sites such as pools Atlantongo, San Sebastián Xolalpan, Tetila, the neighborhood of the nobles at Teotihuacan; or Atetelco, school warriors; Tepatitla and Paradise of Tlaloc. There are also other activities such as ecotourism and hiking, walking, gotcha, canopy and camping. Five minutes from the pyramids of Teotihuacan, Mexico you will find the Animal Kingdom theme park, which houses animals from around the world in a broad and privileged space for its good weather. Make the safari ride and admire buffalo, deer, camels, buffaloes, giraffes, zebras and lions. Also visit the aviary, farm and stables where young and old can interact with all animal species. Choose the type of ride you want, from one day trips, to spend a weekend and exploit the spaces that offer lodging and food. There are even places where you can bring your tent and spend the night in the light of the stars, near the pyramids as witnesses of your adventure.